Here are a few examples of our bodywork and paint jobs as well as additional customization with repairs and aftermarket or upgraded OEM parts. 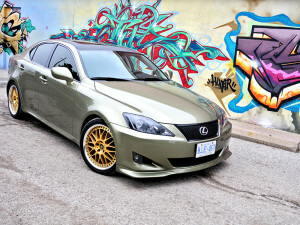 This Lexus has a custom body kit colour matched to the rare olive green paint. The wheels and styling was done completely by the JD Auto Collision team. 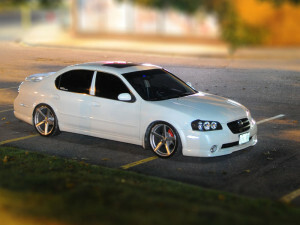 This Maxima is outfitted with a lot of bodywork including the full lip kit and custom lights and paint. The lowered suspension and staggered wheels give it a great finishing stance. This Lexus IS300 has a full gloss white paint job and lip kit. This car is outfitted with custom lights and a vinyl wrapped hood and roof as well as custom painted black accents and powder coated matching rims.